5 What are The Best Gun Safes for Home? When you're looking for the best gun safes for home, there are some key features to keep in mind. Most likely, you're looking for a safe to hold your handgun, something that you can place out of the way, but where you'll have fairly easy access to it should an emergency occur. If you have a family and kids, you'll want something that provides extra security and is virtually impossible to open in order to keep your children safe. To help you with your next gun safe purchase, we've put together four home gun safe reviews, considering the features that deliver the most performance. Our choice for the best home gun safe is the, Personal Safe by Stack-On, one of the leading gun safe manufacturers. This gun safe is made by one of the best home gun safe brands available, providing an extra sense of security and peace of mind. 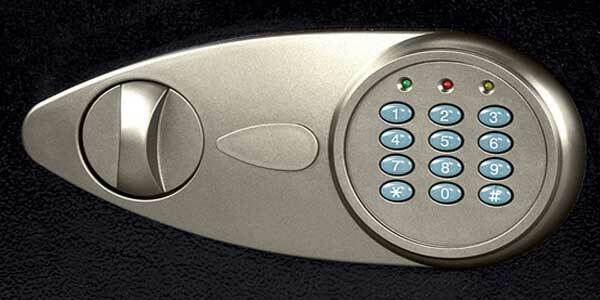 It features an electronic lock with a three-point locking system and a full steel body construction. Two live action steel bolts with concealed hinges afford protection against pry attacks and make this safe virtually impenetrable. It comes with a removable shelf to allow for greater storage capacity of smaller items, such as storing ammo on one shelf while your handgun rests below. Both the bottom of this gun safe and the shelf feature a full coverage foam padding to protect your gun from getting banged up. Adjustable barrel rests are also included to provide a more secure fit for your handgun. This gun safe measures 9.63 by 9.63 by 13.8 inches externally and has enough room internally to fit two full-size handguns. 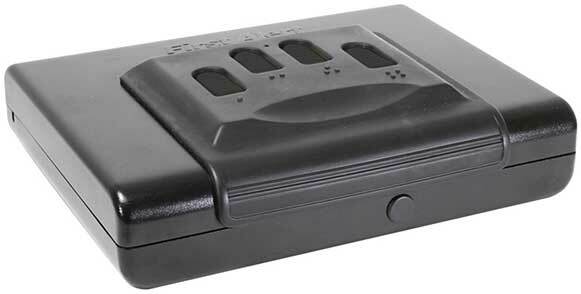 The electronic lock runs on four AA batteries, which are included. There is an override key included also, in case you should forget the key code or if the batteries go dead. It also comes with a limited three-year warranty against defects in materials or workmanship. See more of this Stack-On Personal Safe... Click here. This gun safe is constructed of heavy duty 18 gauge steel and features a unique four button eyes free electronic lock. This lock can be programmed with a code between three to eight digits, with the ergonomic design allowing you to easily enter the key code while you keep your attention elsewhere. This is a great feature should an emergency arise and you need quick and stealthy access to your gun. The interior's top, bottom, and hinge side are fully covered with foam padding to protect your handgun or pistol from scratches or dents. The lock is spring loaded for easy opening, with the lid staying open while unlocked so you can more easily retrieve your gun. This gun safe has predrilled mounting holes for secure and permanent mounting in a drawer or in your vehicle, and it also comes with a 1500 pound test steel security cable. This gun safe is portable, thanks to the security cable. It measures 10 inches long by 12 inches wide by 3 inches deep and weighs 4 pounds. This provides plenty of internal space to hold two subcompact handguns. This is a full steel body constructed gun safe with a hardened steel lock plate that provides protection against drill attacks. It features an electronic lock that requires a two to eight digit key code, with two included override keys, in case you forget your key code or if the batteries run dead. Three LED lights (one red, one green, and one yellow) guide you through the easy programming of your safe. Concealed hinges, two solid steel live action bolts, and pry resistant constructed body afford a high level of security to your handguns and valuables. The interior of the safe features soft carpeting to protect your handguns from scratches. This gun safe measures 8.7 inches by 13.8 inches by 10.6 inches externally, with internal measurements of 8.5 inches by 13.6 inches by 8.6 inches. It weighs 19 pounds and is backed with a one year limited warranty. It runs on four AA batteries which are not included and comes with all of the mounting hardware necessary to securely and permanently mount this safe to the floor, wall, or even inside the trunk of your car. 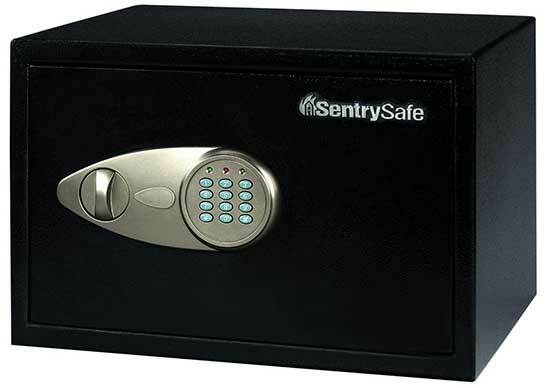 SentrySafe is pretty known by taking proud in their products and their manufacturing operations based in the United States. See more of the SentrySafe X055... Click here. 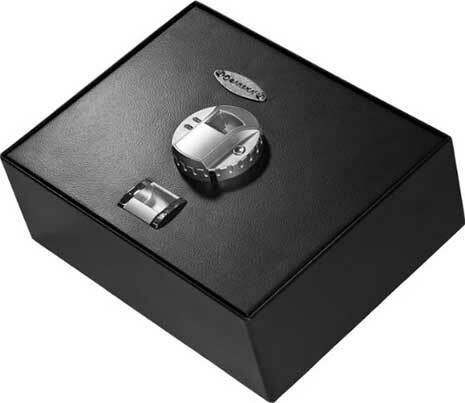 This safe is opened easily with nothing more needed than your fingerprint. It opens from the top, which makes this safe designed perfectly for mounting inside of a desk drawer or the trunk of your car. The fingerprint control can store up to 30 fingerprints, which can be convenient if you want to make sure all of the adults in your family have access (in case of any emergency) or in case you want to program each of your fingerprints into the safe in the event of an extreme situation. Two override keys are included also. This gun safe features a hydraulic door system that effortlessly opens the door to the safe once a registered fingerprint is placed upon the scanner. This hydraulic system then holds the door open so you can easily access your gun and/or valuables. The lock is powered by four AA batteries which should last for up to two years. The interior floor of the safe is carpeted to protect against scratches and dings. It measures 14.75 inches by 11.25 inches by 5 inches externally, with internal measurements of 14.5 inches by 11 inches by 2.5 inches. This safe weighs 21 pounds and comes with one year limited warranty. What are The Best Gun Safes for Home? 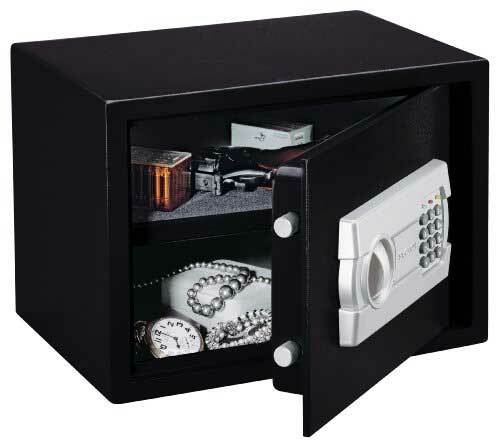 The best gun safes for home need to provide you peace of mind that no one can access your gun safe without permission. Dial combination locks just don't provide the necessary security needed, which makes electronic key code and biometric locks the best choice. In this best home gun safe review, we chose the Personal Safe by Stack-On as our number one gun safe for home use. Its size allows you to fit up to two full size handguns in it, or one handgun with plenty of ammo for an emergency. This gun safe's padded interior provides extra protection against damage to your gun and valuables, and the included barrel rest is something you don't normally see in a safe this size. Plus, the price on this safe is really good, too.